The same toothpaste that you use to polish your teeth can come in handy to clean lots of things around the house. Toothpaste is a mild abrasive, often made with baking soda, that removes dental plaque. That same abrasive action works wonders on removing scuffs and stains on everything from walls to shoes. You can even use an old toothbrush for small items you're cleaning with toothpaste. It's best to stick with a solid white toothpaste rather than a gel. The gel formulas often contain a bit of dye that can discolor some materials you're trying to clean. Be sure to avoid getting the toothpaste on fabrics because it can leave a bit of a stain. If you're out of bathroom cleaners, toothpaste makes a suitable substitute. Just remember to factor in the cost if you have a large area to clean. A dab of toothpaste on a soft cloth will leave chrome sink and shower fixtures looking great. Rub on the paste in small circles and then buff away with a dry cloth. A bit of toothpaste on a damp sponge or cloth will remove soap scum buildup on shower doors and fiberglass shower enclosures. Rinse with a cloth dipped in clean water and buff dry to prevent water spots. If you drop some toothpaste in the bathroom sink, don't just rinse it away. Grab a damp sponge and use it to clean the entire bowl. Rinse well and buff dry. It will even leave the drain smelling minty fresh. If you need to clean the toilet quickly and you're out of cleaner, squirt a bit of toothpaste into the bowl. Grab the toilet brush and scrub away. The paste will remove stains and leave a fresh odor. It won't disinfect the toilet to get rid of bacteria, but it will work in a pinch. Curling irons, hair straighteners, and curlers can get a gummy coating from hair products. Toothpaste removes the gunk easily without damaging the appliance surface. Put a dab of toothpaste on a dry cloth and wipe away the buildup. Finish by wiping with a damp cloth and allow the surfaces to air dry. Use a bit of toothpaste on a damp cloth to wipe down mirrors. Work in small circles and allow the toothpaste to dry; then buff with a dry cloth. Toothpaste is perfect for small clean-ups on shoes and jewelry. If the rubber trim on sneaker soles or toes is dirty, use a bit of toothpaste on an old toothbrush to give the trim a good scrubbing. Finish by wiping away the leftover toothpaste and soil with a damp cloth. A dab of toothpaste on a soft cloth or sponge will remove scuffs from smooth leather, patent leather, or vinyl shoes. Work on a small area at a time and then buff away the residue and scuffs with a soft cloth. Remember, it won't work well on suede leather shoes or boots. Toothpaste works great if your silver jewelry has tarnished or your diamonds are looking a bit dull. 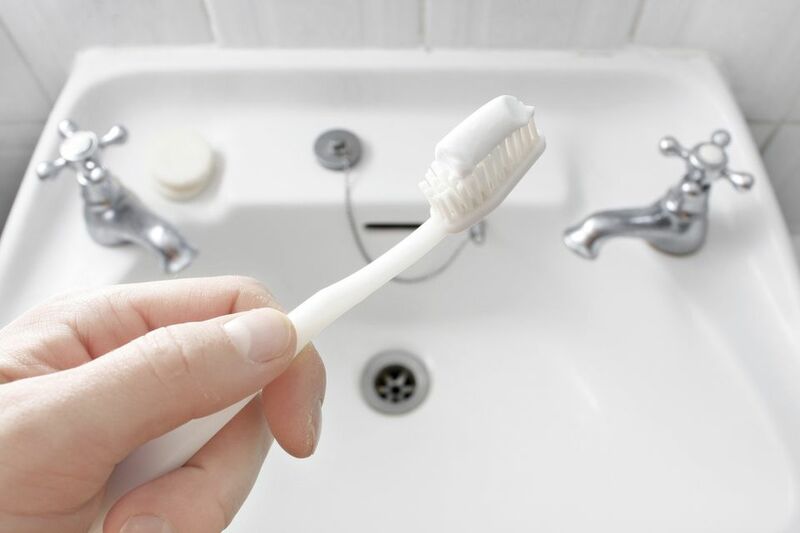 Use just a tiny bit on an old toothbrush working to get into every crevice. Rinse well and buff with a dry cloth to see the piece sparkle. Never use toothpaste on soft gems like pearls or opals that can become scratched from the abrasive quality. Toothpaste doesn't have to stay in the bathroom, it can work magic in the kitchen, too. If you have problems with onion or fish odors lingering on your hands after preparing food, just squirt a dab of toothpaste into the palm of your hands. Rub your hands together for a few seconds to reach every surface and rinse well. The odor will be gone. You may even see that your fingernails look whiter and brighter. Grab the toothpaste and a soft cloth to give silver serving pieces a good cleaning. Just rub on the paste and watch the tarnish transfer to the cloth. Rinse well in hot water and buff with a dry cloth. For copper pots that are heavily tarnished, rub on the toothpaste and let it work for a few minutes before wiping away the tarnish. Rinse in hot water and shine with a dry cloth. Don't forget about using toothpaste in the rest of the house and the garage. Vintage pianos have keys made from ivory (teeth) so toothpaste works well to clean away dirt and scuffs. Modern piano keys are made from plastic but toothpaste works equally well for cleaning. Use a small amount of toothpaste and an old toothbrush to reach tight areas and then wipe down with a damp cloth. If the bottom of your iron has build-up from starch and looks a bit scorched, put some toothpaste on a soft cloth and wipe away the gunk. Be sure the iron is completely cool and finish by wiping off any toothpaste with a damp cloth. A bit of toothpaste on a damp sponge will remove stray crayon marks from painted walls. Finish by wiping down with a damp cloth and allow the area to air dry. Toothpaste on a sponge will not only remove road grime and insect specs from car headlights but will buff out small scratches. Wipe on and rinse with a damp cloth. Just a tiny amount of toothpaste on your fingertip will buff out small scratches from a cell phone screen. Finish by wiping away with a damp cloth and allow the phone to air dry.